In the new age of mobile applications and the cloud, user expectations have changed and the focus of content management has once again shifted. Anywhere, anytime access and usability expectations are as important as interoperability and process considerations. Organizations want a data-driven culture that informs a customer-first mentality and helps teams better serve and interact with customers. To achieve these goals, content management services not only must handle the exploding volumes of business inputs/data, but also must give insight into that data to improve decisions and create new opportunities. Systemware has been part of this digital journey from document management to ECM to content services. And, we have pioneered many important technological developments to support this evolution and our customers’ digital transformations. 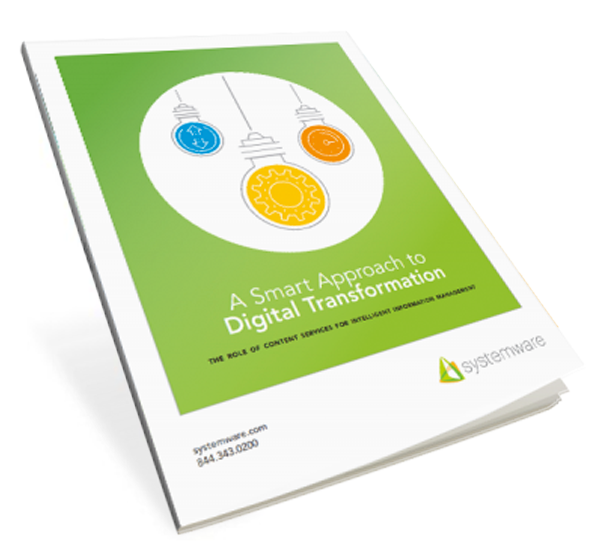 This whitepaper takes you through this technology journey and—based on Systemware’s history in content management—offers our perspectives on digital transformation, the evolution of ECM to content services, and some of our innovations that support this journey.